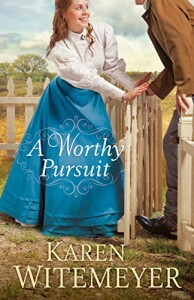 I was having a serious I’ve-read-this-before moment as I began to read Karen Witemeyer’s latest novel, A Worthy Pursuit. Not the “oh, this has been done before” kind of moment, but an honest to goodness, without a doubt “I have read this book before” moment. Once I realized that I had read a teaser, I began to remember how much I hated that I had read it. Hated it because it made me want to read a book that I would have to wait for, and waiting is hard. So, the premise: School Headmistress spirits away three of her students in the middle of the night, including a girl she has legal guardianship of. She does this, with assistance from the school caretaker, to protect the girl from her Grandfather. Enter the Bounty Hunter with the broad shoulders, straight out of a dime store novel, working his last retrieval before retiring. Sent by the grandfather to retrieve the girl, Lily, from her kidnapper, he is shocked to find a family rather than a victim and her kidnapper. The question is, will the bounty hunter and the teacher be able to work together against other men who are after Lily for the bounty. Along with three precocious children, there are musical interludes, a cantankerous but heart-of-gold caretaker, enemies, allies and desperate men. Two secondary romance stories (one successful and one potential) are also included. I go into a Karen Witemeyer novel expecting to enjoy the journey of her characters towards shared faith and love, and I have not yet been disappointed. While all of her novels have that magical blend of faith, romance, humor and action, this outing seems a bit darker somehow, the danger greater and the main characters dealing with more traumatic backgrounds. 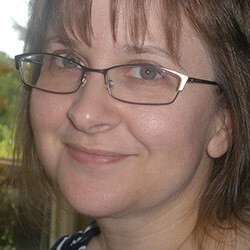 It makes me wonder how her storytelling will develop further in the next novel. I look forward to finding out. If you are a fan of Karen Witemeyer, inspirational romance, historical fiction set in Texas, daring bounty hunters and school teachers who aren’t always as prim as expected, then give A Worthy Pursuit a go. I think you’ll like it. This review refers to a NetGalley review ebook read for free courtesy of Bethany House Publishers, in exchange for an honest review.